Who is Franke James and why is she on the W-list? Very kind of Liz to have vaulted me onto the W-list of notable women bloggers. 1. Office-Politics (a blog that is teeming with office politics issues from Backstabbers to Office Princesses). 2. And my Franke James blog — where I write, illustrate and photograph on environmental issues. In the past 6 months I’ve blogged about selling our SUV, building a Green Driveway, and written a letter to my future Grandkids in 2020! I also write a feature called My Green Conscience — where I wrestle with the difficult reality of being green in North America. I am an artist, writer and storyteller. I have done many fun things over the years, including inventing online pseudo-psychology games like The Room, whacking the heads of Canadian politicians for saying too many dumb and stupid things, doing photography in snazzy places like Madrid, London and San Francisco, speaking to artists at software conferences about surviving and thriving, and telling visual stories about events like this Peace camp for kids. To read a more historical bio please visit my James Gang site. My two main blogs are not really typical blogs at all, but they are catching people’s attention, and I hope, contributing to making the world a better place. Check out my FrankeJames.com blog for two recent visual essays, A Green Winter: Will Global Warming be Good for Canada? and My SUV and Me Say Goodbye. The essays have been featured in the Toronto Star, Treehugger, Worldchanging, and some great blogs like Mark Federman’s What is the Message, Martin Edic’s Burner Trouble and Bentley’s Eco-Sherpa. 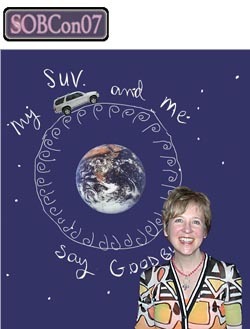 I was honoured when the Ottawa Citizen ran My SUV essay as a double-page spread, for Earth Day! A Green Winter started out as a blog post, and is now morphing into a book and an animated mini-movie. The book opportunity happened when “A Green Winter” caught the eye of the University of Victoria (via a science news service). It will be published in an anthology of readings for Canadian university students entitled Perspectives on Contemporary Issues, including authors Stephen Lewis, Ken Dryden, David Suzuki, Margaret Atwood and others. Co-edited by Kim Blank and Stephen Eaton Hume, University of Victoria. (Thomson Publishing, Autumn 2007). Another surprising opportunity came along when Denise Donlon, former President of Sony Music Canada spotted my Green Winter essay on Eco-Sherpa and asked me to show it at the Green Living Show. So, I’ve reinterpreted the essay as an animated movie, with music composed by David Gray, Big World Songs (and former band member of the Parachute Club). How cool is that? Very. My Office-Politics daily blog is a collaborative effort, drawing on the talents of experts in the areas of executive coaching, leadership development, dispute resolution, employment law, PR and ethics to answer letters submitted to the site. The Office-Politics Advisory Board includes authors, Dr. Rick Brandon and Dr. Marty Seldman, Arnie Herz, lawyer, Dr. John Burton, lawyer and ethicist, Peter Garber, author, Timothy Johnson, author, Jennifer Glueck Bezoza, MA, Gregory Ketchum, Christine Comaford-Lynch, author and Erika Andersen, author. We have the microphone. And it’s Live. Many thanks to Liz Strauss for creating this wonderful list of outstanding women bloggers.